Get ready for a new season of Cooks vs Cons. The third season of the Food Network series will premiere later this month. Geoffrey Zakarian of this competition series. Food Network shared a press statement for the new season of Cooks vs Cons. Check that out below. Cooks vs. Cons returns for a new season of the suspenseful culinary competition on Wednesday, November 23rd at 9pm ET/PT on Food Network. Geoffrey Zakarian hosts each episode as four contestants – two professional chefs (“cooks”) and two con artists (“cons”) – conceal their true identities as they race against the clock to whip up delicious restaurant quality dishes. The pressure is on as they must try to convince a rotating panel of judges, including Ted Allen, Sunny Anderson, Scott Conant, Alex Guarnaschelli, Eddie Jackson, Jeff Mauro, Daphne Oz, Curtis Stone, Jet Tila and Justin Warner, that they are the real deal. The cooks’ and cons’ skills, agility and adaptability are tested as they must incorporate a secret ingredient into their dishes during the two rounds of competition. With a level playing field, and no one knowing who is who, only a blind taste test will prove who has the best dish. If the professional is victorious, they’ll take home $10,000, but if an amateur can out cook the pro, they’ll walk away with $15,000! Premiering Wednesday, November 23rd at 9pm ET/PT – PREMIERE! Contestants must be on gourd for the French toast battle, as surprise ingredient pumpkin gets carved up into the dishes. Then, in round two, judges Alex Guarnaschelli and Curtis Stone attempt to separate the pros from the home cooks as they determine whose dish is tops, when ice-cream toppings are used to accent savory staples. The dumpling challenge is filled with surprises as professional chefs try to wrap up the big cash prize from their amateur rivals, but the addition of peanuts creates some nutty interpretations. In the next round, potato fries must be repurposed into the culinary creations. Judges Alex Guarnaschelli and Sunny Anderson savor the twice-fried masterpieces on the way to choosing a winner. Judges Ted Allen and Daphne Oz ring in the holidays, as rack of lamb is infused with traditional holiday drinks, celebrating the contestants’ rib-sticking fare. Forget naughty or nice, who’s a cook and who’s a con? Round two stays festive, when holiday treats are re-gifted as flavorful dishes and the judges must choose a winner before dozing off in a blissful food coma. Pro and amateur cooks let their passions boil over during the pasta challenge, as Asian condiments must be used to achieve umami bliss. Then round two boasts more apples than the Garden of Eden, as judges Alex Guarnaschelli and Jet Tila eat sinfully delicious savory apple dishes before choosing a winner. The frittata challenge isn’t all it’s cracked up to be, as the contestants’ creamy egg cakes must mingle with zesty surprise ingredient olives. Judges Daphne Oz and Justin Warner attempt to separate the pros from the home cooks in round two, as staple food – rice – or offset by commas rears its starchy head. Judges Daphne Oz and Scott Conant open Pandora’s lunchbox, as cooks must include kid’s lunch snacks in a traditional steak and egg pairing. Then the pros and amateurs face a tangy twist in round two, as surprise ingredient mustard encourages some spicy outcomes. And many more in new episodes in January and February 2016. After incognito home cooks “cons” battle undercover culinary pros “cooks”, fans can catch highlights from the show and can take a quiz to find out if they could pose as a pro chef at FoodNetwork.com/CooksVsCons, and they can also share the results using #CooksVsCons. Cooks vs. Cons is produced by Cakehouse Media. 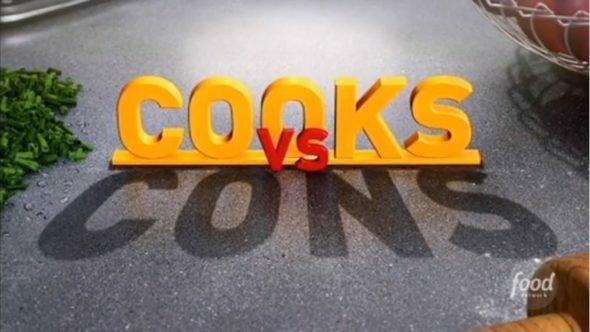 Are you a fan of Cooks vs Cons? Tell us what you think. More about: Cooks Vs Cons, Cooks Vs Cons: canceled or renewed?, Food Network TV shows: canceled or renewed?